This is a beautiful bonsai tree gift suitable for many occasions with a lovely 'With Much Love' porcelain tag. A lovely flowering broom style indoor bonsai with drip tray, pruning scissors and bonsai fertiilser. The small white flowers contrast beautifully against the blue glazed pot. Delivery is free to most of the UK. You can add your message, personalise your bonsai or choose from gift wrap options below. Height: ~ 20cm Pot size: ~ 12 x 5 cm Age: 6 years Please note that all bonsai are unique and that some slight variation from the photograph shown should be expected. All sizes are approximate. Great little bonsai. I personally chose this one as it flowers. 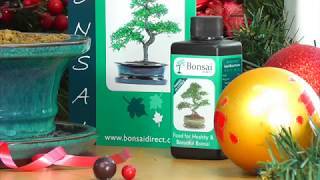 Order Christmas Bonsai Gifts NOW!